How does a district in Argentina with only a few small branches have 17 temple marriages in less than four years? Leaders say the answer is simple: obedience. When 21-year-old Gisela Silva moved with her family from Mendoza, Argentina, to the nation’s southernmost city of Ushuaia, she wondered whether she’d left behind her chances of marrying in the temple. Mendoza, after all, has a stake filled with wards of Latter-day Saints, while isolated Ushuaia﻿—located on the island of Tierra del Fuego﻿—has only about 600 members attending three small branches. Lucas Romano had the same concerns as Gisela. 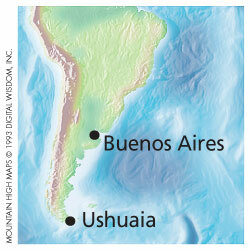 During his mission to Uruguay, his family had moved to Ushuaia. When he joined them after completing his mission, he quickly noticed that young single adult men outnumbered young single adult women. He was determined, nevertheless, to obey the counsel of local leaders to date only members of the Church. That counsel became easier to follow after Lucas met Gisela at church and she enrolled in English classes at a school where he teaches. He began walking her home after class, and they soon began dating. As they prayed individually about their growing relationship, they say that confirmation came “line upon line, precept upon precept” (2 Nephi 28:30; D&C 98:12). In April 2005, Lucas and Gisela married civilly, as required by Argentine law, and then were sealed in the Buenos Aires Argentina Temple. Their sealing was significant for the young Church membership in Ushuaia: it was the first of 17 temple marriages in less than four years. How does a district with only a few small branches have so many temple marriages in such a short time? The answer, according to local leaders, is simple: obedience. President Tossen admits, however, that local leaders “had to work on this districtwide effort for a while” before their teaching and counseling about the importance of temple marriage bore fruit. Roberto Ignacio Silva, Ushuaia district president, says what got his attention after he moved with his family to Ushuaia in 2004 was the number of unmarried returned missionaries and young adult women. His daughter Gisela became part of that group. He said young adults had a goal to marry in the temple but needed some encouragement and direction. In addition to increasing activities for young single adults﻿—including firesides and combined activities with young single adults from Rio Gallegos and other cities to the north﻿—leaders emphasized the importance of prayer, faithfulness, and worthiness. They also encouraged young adults in Ushuaia to muster sufficient faith to overcome their fears. Ruth Rodríguez got to know Emanuel Silva when the two were asked to help organize a combined district young single adult activity in Rio Gallegos, more than 200 miles (320 km) to the north, in February 2006. The friend who asked the two to work together hoped they would hit it off. “It worked,” recalls Emanuel, who had been home two years from serving in the Arizona Tucson Mission. When he and Ruth married six months later, their preparation﻿—spiritual and temporal﻿—helped them overcome their fear of the future. The cost of their flight to and from the Buenos Aires Argentina Temple in 2006 exhausted their savings. “Afterward we had nothing,” says Emanuel, echoing a common newlywed refrain. Today he and Ruth laugh at that memory, grateful that their faith afforded them the “beautiful experience” of being sealed in the temple﻿—an experience that still means everything to them. When Ezequiel Agustín Frau lost his job in early 2006, he’d been home from his mission to Colombia for nearly two years. He was still single but felt that his future wife was not in Ushuaia. He decided to go to the temple to seek direction. When he reached Buenos Aires following a three-day, 2,000-mile (3,200 km) bus ride, he stayed with friends and then a relative while frequenting the temple. Several weeks later Ezequiel was running out of money and considering a return to Ushuaia. A local bishop found him a job, however, so he decided to stay. At a Church activity a short while later, Ezequiel met a young woman named Marina Mas. They found it easy to talk, and he quickly felt comfortable around her. When he saw Marina again at a young single adult gathering, she said something that impressed him. “We should be living at the level of the kind of person we are looking to marry,” Ezequiel recalls Marina saying during a discussion about goals. For her part, Marina had been praying to find a worthy companion. She knew a lot of young men but was immediately impressed with Ezequiel’s spirituality. A mutual friend helped Ezequiel find a place to live that was closer to his work, then three hours by bus from where he was staying. It turned out that his new apartment﻿—in a city of 13 million people﻿—was only two blocks from Marina’s home. Living in close proximity gave Ezequiel ample opportunity to see Marina, whose family gave him a warm welcome. The confluence of events was an answer to his prayers. The couple dated and soon began planning their future together. After marrying in the temple in the fall of 2006, they moved to Ushuaia. President Tossen says one of the greatest blessings temple marriage has brought to Ushuaia is that “the day is arriving when the Church will be led by children of the covenant. The gospel will spread here as a result, and the Lord will bless the Church”﻿—just as He is blessing faithful couples who marry in the temple. Her example helped her father enter the waters of baptism in 2008 and then take his family to the temple, where they were sealed a year later. President Gordon B. Hinckley (1910–2008), “What God Hath Joined Together,” Ensign, May 1991, 71. Map by Mountain High Maps © 1993 Digital Wisdom, Inc.
“The largest blessing of being married in the temple is the happiness I feel in knowing that we are united as an eternal family,” says Ruth Silva, pictured at right center with her husband, Emanuel, and their daughter, Banira. Top: Ezequiel and Marina Frau, with their daughter, Ailín. Bottom: Lucas and Gisela Romano, with their children, Benjamín and Rebeca. “If we desire an eternal companion, we don’t have to look for someone perfect. But we must pray and ask the Lord to help us, and we must remain faithful in the Church,” Roberto Ignacio Silva, Ushuaia district president, told young adults, many of whom (pictured above) have taken that advice to heart and have married in the Buenos Aires Argentina Temple.